Joy Labinjo 'Gatherings’ (2018) installation shot. Photograph: Ash Howland Davenport. 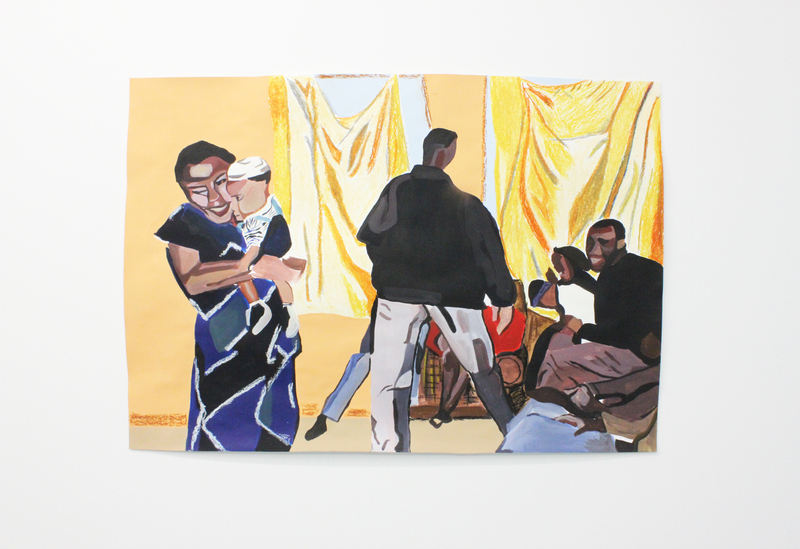 Following the success of her first solo exhibition – Belonging at Morley Gallery, London – Newcastle University graduate Joy Labinjo returns to Tyneside with Gatherings at GOLDTAPPED, an artist led gallery space in The NewBridge Project. The recipient of the 2017 Woon Art Prize presents here an array of smaller-scale painted sketches that portray a vibrant and colourful transcription of family photographs. 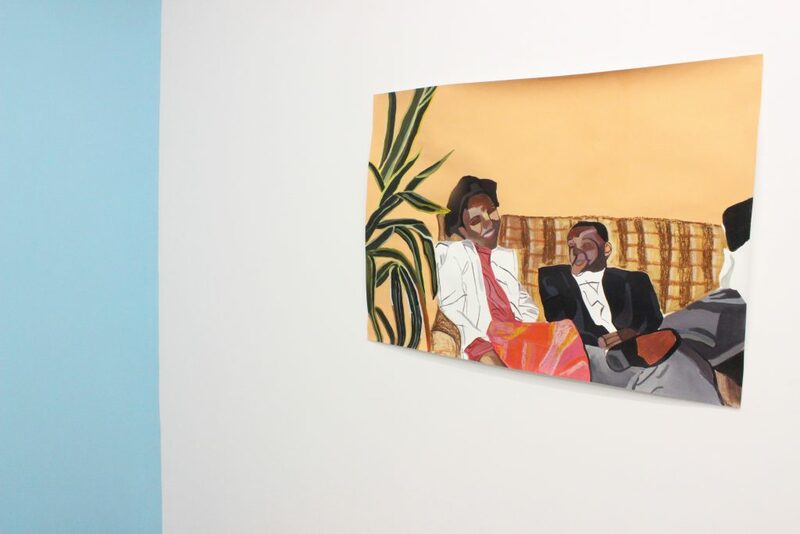 Synonymous with the larger paintings that were shown at the Morley Gallery, and indeed the Newcastle University Fine Art graduate show last summer, Labinjo offers a body of work born out of her British-Nigerian heritage. In visually assessing the relationship between identity and race, the audience is welcomed into convivial scenes where saturated hues imbue warmth, and the ingenuous patterned clothing is at once evocative of traditional African attire and yet so delightfully familiar. The immediacy of the medium – the blocks of colour, the granular traces of the oil pastel – pose the drawings as visualisations for larger-scale paintings, but Labinjo insists upon the cessation of this particular project. Her instantly recognisable style was partly developed during her time in Vienna, where she studied as part of the Erasmus EU student exchange programme. It was a period that was conducive to her determination and commitment: where she challenged and compelled herself to constantly create work, and to get more out of it than she put in. Following the success of her recent endeavours, it would seem Labinjo is now reaping the rewards of her labour. Joy Labinjo ‘Gatherings’ (2018) installation shot. Photograph: Ash Howland Davenport.. In embodying the simultaneity of ‘connect[ing] with personal histories’ and ‘uproot[ing] them’ these drawings also represent Labinjo’s first foray into the practice of oil pastels. Labinjo details her tribulations with the medium before directing attention to the sole canvas in the exhibition. Situated through a doorway, the coarse surface texture disrupts the line of oil pigment to a far greater extent than those on paper, giving the artwork a hastier – though by no means worse – appearance. The remaining drawings on paper are rendered in smoother pastel, acrylic and domestic wall paint; their aesthetically satiating blocks of colour mirrored in the baby blue and pure white of the gallery walls. The contrasting irregularity of the concreted floor disputes the otherwise pristine saturation of the colours, whilst reflecting the sketched pastel aspects of the pieces remarkably. Labinjo expresses her alliance with figurative painters – whom all too often find themselves suppressed in an art school environment that very much endorses conceptual approaches. She struggles to comprehend this aversion to painting given its undeniable popularity outside of university environs. Her advice to aspiring students? Do what you want. It’s what she did. Gatherings, GOLDTAPPED, The NewBridge Project, Newcastle upon Tyne. 23 February – 24 March.